Yes, the residents of the Eastern Seaboard will need building supplies to deal with the destruction from this year’s hurricane season. They’ll also need a safe place to sleep when they evacuate. And I’d bet nobody would mind some community support to deal with such an incredibly stressful situation. But to exploit the imminent disaster as a marketing ploy goes beyond bad taste. Stocking up on popcorn for Oscar night or guacamole for the Super Bowl is one thing. But people die in hurricanes. 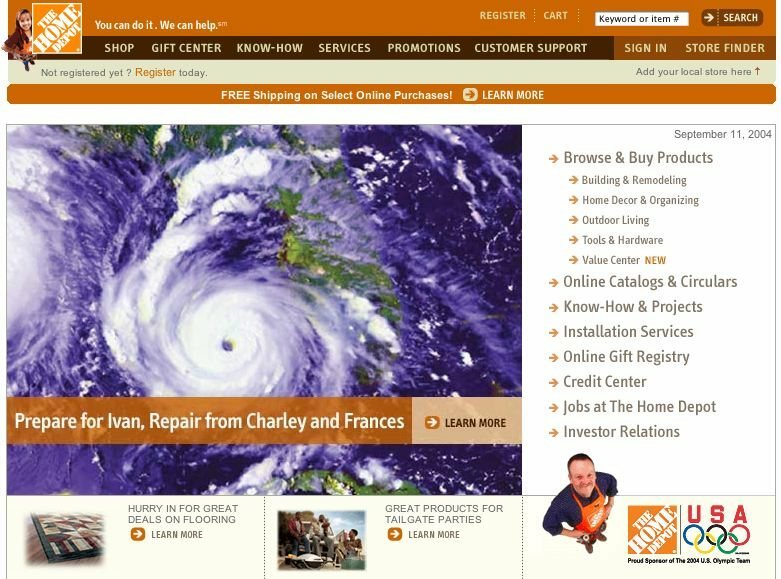 This Home Depot home page is just shameful. Update: Wired News reports on targeted advertising on weather tracking sites, and the increasingly sophisticated techniques being used. "Advertisers can pick a particular place, age group and even weather condition under which they prefer to pitch their product. In one case, [vice president of marketing for WeatherBug Pete] Celano recalls, a movie studio advertised a film only in places where it was raining that weekend." To me, this is a fascinating and unobtrusive form of directing marketing – few advertisers actually want to try selling the proverbial air conditioning to an eskimo. However, there are limits to what some will try. "So far, however, advertisers have shied away from hurricane-specific promotions. 'It would probably be inappropriate to do, say, plywood during a hurricane,' Celano said."